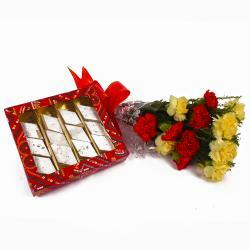 Product Consists: Basket of 20 Mix flowers like Carnations, Roses, Gerberas along with Pack of Gulab Jamuns (Weight : 1 kg). 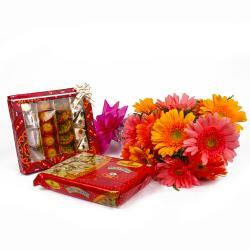 Spread smiles by treating your loved ones to heart warming gifts on their special occasions. You can gift this combo on many occasions like Birthday, Anniversary, Housewarming, Baby Shower, Baisakhi, Republic Day and many more. This is a glorious arrangement of seasonal fresh flowers bow tied with matching ribbon on it along with gulab jamun, also paired with these blooms to make it a super special hampers. Gift it to dear ones on special events and make them feel loved. Select this special gift combo and order it online and we will make sure it will be deliver as per your expected time. Along with this, send other Gifts to India through Giftacrossindia.com to be delivered in a safe and speedy mode. This gift hamper contains : Basket of 20 Mix flowers like Carnations, Roses, Gerberas along with Pack of Gulab Jamun (Weight : 1 kg).